Manama, Feb. 12(BNA): In compliance with the directives of His Royal Highness the Prime Minister, Prince Khalifa bin Salman Al Khalifa, to dedicate a half-work day engaging in sports activates, and the initiative of the Representative of His Majesty the King for Charity Works and Youth Affairs, Chairman of the Supreme Council of Youth and Sports and President of Bahrain Olympic Committee, His Highness Shaikh Nasser bin Hamad Al Khalifa to hold a national sports day in the second week of February each year. 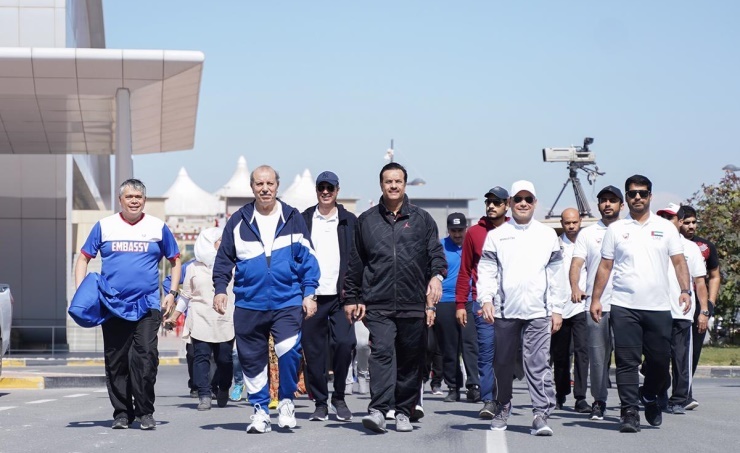 The Ministry of Foreign Affairs organized a sports event, with the participation of a large number of officials and employees of the Ministry, ambassadors and Embassy employees accredited to the Kingdom of Bahrain. On the occasion, the Assistant Foreign Minister, Abdulla bin Faisal bin Jabur Al-Doseri, expressed his delight for allocating a day dedicated for sports every year, stressing the importance of such events in motivating and creating an atmosphere filled with creativity. He also highlighted the crucial element of being active in sports, as it contributes to sustainable development for its pivotal role in maintaining human health and promoting economic and social progress in society. The event underscores the Ministry of Foreign Affairs' keenness to strengthen relations between its employees and members of accredited embassies in the Kingdom, emphasizing the importance of sports in improving health and increasing activity, which ultimately contributes to executing tasks seamlessly, and overcoming the pressures of work to benefit the individual, the institution and the society. The event was held at the Bahrain Volleyball Association and the Bahrain Table Tennis Federation. It included a variety of sport activities such as jogging, table tennis, volleyball and fitness exercises. Embassies and Consulates of the Kingdom of Bahrain abroad celebrated National Sports Day, where time was allocated for physical exercise outside the premises of the missions.